Ground beetles are unique in that they can be both beneficial insects or nuisance pests. Predaceous ground beetles can be a nuisance when numerous. They are attracted to lights and can sometimes be found by the hundreds around lights in the morning. The large numbers can also be a problem because the beetles defend themselves by emitting an odor. Ground beetles are part of the order Coleoptera. This is the largest order of insects with over a quarter of a million species described throughout the world — about 30,000 species in the United States. Most beetles have two pairs of wings (elytra). The front pair is usually thickened and hard and meet in a straight line down the back when the wings are at rest. The back pair are membranous and folded beneath the front pair. All beetles have chewing mouthparts and undergo complete metamorphosis (egg, larva, pupa and adult). Predaceous ground beetles belong to the family Carabidae. This is the second largest family of beetles, with more than 2,500 species in North America. Most members of this family are considered beneficial, feeding on other insects in both the larval and adult stages. A few species feed on seeds and organic litter, but only rarely does the feeding produce economic damage. The different common names refer to the family’s habits. Because ground beetles are effective predators of caterpillars, the name “caterpillar hunter” is used frequently. The name “caterpillar hunter” usually applies to the genus Calosoma, a brightly colored ground beetle. Some species are called “bombardier beetles” because they emit what appears to be smoke from the rear of the abdomen. The “smoke” is actually a glandular fluid that vaporizes when it hits air; the fluid can irritate the skin. The ground beetles also emit an odor to stop their enemies, including people. Most ground beetles are black or dark red, although some species are metallic blue, brown or green. Most species have a thorax (middle body section) that is narrower than the abdomen. The adults have long legs, are fast runners, can fly and are attracted to lights at night. 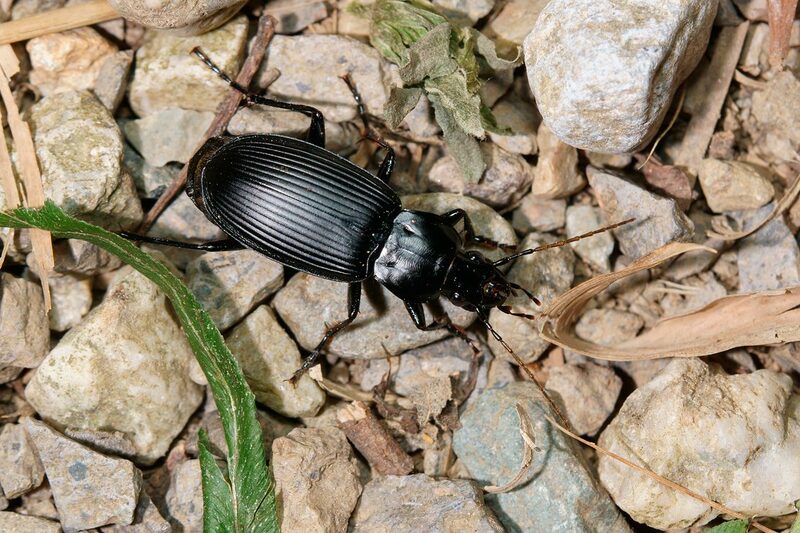 As their name implies, most ground beetles dwell on the ground. However, some species will climb bushes or trees to feed on caterpillars, and some species feed on snails and slugs. Ground beetles can consume their body weight in food each day. Both adults and larvae feed on ground dwelling insect larvae and pupae. The life cycle (egg to adult) of ground beetles requires a year. Winter is spent in the larva or adult stage. The female lays eggs singly on the soil surface, and the egg hatches into an elongated larva. The larva has three pairs of well-developed legs and, unlike other beetle larva, run quickly. The full grown larva of larger species can be 3/8 to 1 3/4 inches long, slightly flattened, cream to brown colored and slightly tapered at each end. The head bears sickle-shaped jaws (mandibles). The larva develops through several stages (instars) before pupating in earthen cells. The adult emerges from the earthen cells to mate and disperse. An adult can live for two to three years. Little is known about most ground beetles since most of their activity is at night. Ground beetles are unique in that they can be both beneficial insects or nuisance pests. In fields or gardens, they feed on caterpillars and other insects and are considered beneficial. However, when numbers are abundant and they start moving to lighted buildings and entering houses, they become nuisance pests. Ground beetles are occasionally attracted to lighted homes and buildings in large numbers. This usually occurs when environmental conditions are good and there has been an abundance of insect food the previous year. When winter moisture is plentiful and temperatures are mild, overwintering larvae (immatures) and adults survive in higher numbers. If food (caterpillars and other insects) is plentiful in the spring, overwintered stages have food to eat and to multiply. Once a food source is used up, the beetles will move to look for other food sources. It is this movement around and into buildings that occasionally causes problems. Ground beetles can also become a nuisance because of the odor they emit for defense. This odorous substance can be objectionable or cause a burning sensation on human skin when the beetles are handled or when large numbers of dead beetles accumulate. Consequently, beetles should not be handled. Prevention. No control is encouraged because the beetles are considered beneficial. When populations are large enough for them to be a nuisance, however, the best form of control is preventing them from entering buildings. Remove objects where beetles can hide such as leaf piles, old boards, rotting logs, stone piles, firewood piles, etc. around house entrances. Caulk and screen entryways into the home. Since many beetles are attracted to lights, subdue the lighting around windows and doors by using less attractive (to beetles) yellow or sodium vapor light bulbs. Avoid excessive lighting directly upon the house during the spring when beetles are abundant. Indoor lights should not shine directly out of door or window openings. Colored walls that do not reflect light are preferable to glossy white. Small numbers of live beetles found indoors can be easily collected by broom and dustpan and relocated outside far from the house since these predators may be beneficial by helping to control other pests. Collect dead and dying beetles with a vacuum cleaner and proper attachments.